I spent the session with cramped leg muscles, and it was difficult to assess how the skates were doing because my legs were too busy trying to deal with the sudden change. I was a little concerned I’d made a very expensive mistake, and perhaps going from five-year-old broken-down Freestyles to brand-new stiff Ice Flys was a bit too much of a difference. I reminded myself of all the low-level adult skaters I’d talked to who loved their Ice Flys and didn’t seem to struggle with the stiffness, and tried to maintain optimism. But man did my legs hurt. I stepped onto the ice gritting my teeth, ready to fight my way back to familiarity, only to find that suddenly I felt fine. A couple of adjustments worked wonders: Silipos gel ankle sleeves, which made my ankles more comfortable, an additional boot punch-out by the shop, and experimenting with lacing technique. I’d been told of the Edea lace-tying technique, but have yet to get it right on the first try, so there was a lot of fiddling with laces. But once I got them, I felt pretty good attempting everything. I can feel the difference in jumps right away, which feel more secure, and I’m excited about improving them. I don’t have spins back yet, but I was pleasantly surprised with my moves, because the shorter blades are really working for me. I’d been warned that shorter blades would require more precision and control and be more difficult to manage, but I’m finding the opposite: It’s like parallel parking a clunky van for years, and then parking a Mini Cooper. My turns feel simpler, crisper. Like there’s less excess energy and movement necessary. Once I got accustomed to the new rocker, my 3-turns and brackets became smoother and more controlled, and the extra ankle support makes a world of difference. On my Freestyles, I struggled with the exit edges of all my turns, and often wobbled, and my coach and I have been working on exerting more body control to keep me aligned throughout the turn. It felt like a lot of WORK to rotate and counterrotate and never let go of my core muscles, because anytime I let my guard down I wobbled. With these new blades, I can feel where my ankle wants to wobble, but the boot keeps me firmly in place and on my edge, and I can ride the edge out of the turn! It’s like magic! With another minor boot punch-out, I felt like I was getting closer to the ideal setup. I still have a few tweaks I’d like to correct, but mostly I felt comfortable on the ice by this point, like I was finally done adjusting to the new feeling. The most notable difference was that I now love how stiff the boots are, now that I’ve figured out how to skate in them, and feel like they are an improvement in all aspects of my skating: moves, jumps, spins all feel more secure and powerful, probably because I feel more comfortable skating into the ice with all that support. Once I got used to my new blades and rocker, I was able to get most of my spins back, and those feel a lot more secure now. I don’t quite know why, but I do know that my spins feel like they can handle more speed and power, and it’s slightly less of a struggle to hook the entry on the ones that give me trouble (camel, for instance). I’m thinking now that I was probably underbooted for a while, and that the softness of the skates were holding me back. While I do think the jump from my old skates to the new ones was pretty drastic, now that I’m getting used to the new setup, I’m really feeling the benefits of the upgrade. I have new skates! Finally! After nearly five years on the same pair of Jackson Freestyles, it was getting to be that time, and partly as a pick-me-up (and partly because I just wanted to), I splurged on the fancy, popular (and expensive!) Edea Ice Flys, which I’d been thinking about for ages but wasn’t sure I was ready for. My old pair have served me well, but I knew for the past several months that they would need to be replaced soon. The sensible part of my brain forced me to be patient and stick with my skates until they were truly done, because they still had life in them and I didn’t want to be wasteful. But the day finally came when, in a lesson, I landed a nice jump with a secure landing… and then just fell, apropos of nothing. My coach was surprised, because she said it was a nice jump and it looked like I was fine, and then suddenly I was down. I laughed that it must mean it was finally time to upgrade, because my skates just weren’t supporting me enough. I’ve been feeling wobbly at times, mostly when landing jumps, like I had to work extra hard after landing to stay in control, and I didn’t feel as secure as I wanted to. One of my goals is to increase power and get more jump speed and height, but I didn’t feel I could on my weak-ankled skates. My Freestyles are my second pair of skates; I started on entry-level starter skates, the kind with plastic soles where you can’t change the blades. More than the boot, I hated those stock blades and was eager to get onto better ones, which is when I got into the Freestyles with the Coronation Ace blades. I liked that setup and felt it has been a good fit for the past five years (minus about six months of non-use), and I didn’t have any issues with fit, so it was definitely a consideration to stick with Jacksons. It would certainly be a cheaper option than the Edeas! But I’d had my eye on the Ice Fly, and given how long skates have lasted me, I didn’t want to wait another five years to try them out. I mentioned them as a possibility to my coach, who approved of them as a good choice. I felt hesitant to make such a leap, because I know that they work for skaters with much more advanced skills than I have, and because they’re so trendy right now, I didn’t want to fall into the trap of choosing something that wasn’t the best choice for me just because it was popular. I knew it was more boot than I need, but it seemed that the consensus is that it’s fine for lower-level skaters, too. I’d heard so many things about how comfortable they are, and how light and easy to break in, and I’ve been seeing them on a lot of low-level adult skaters (Pre-Bronze or lower) who said they all loved the skate. So I felt more comfortable going with the choice, took myself off to the pro shop, and got myself fitted. Will report back on how they do! Oh wow, I’ve had this draft saved in my blog for over a year, and all this time I’d thought it was posted already! I only recently realized it wasn’t, so here it is, better late than never. 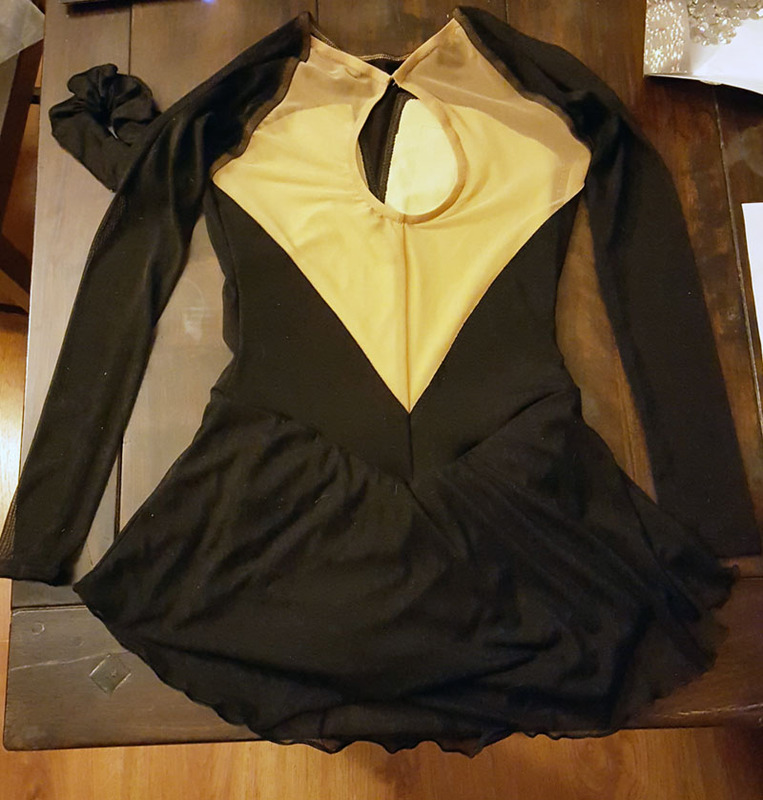 Last year I competed in Sectionals for the first time, and I had a new program for my bronze freeskate and for bronze dramatic, and I needed new dresses. Because I had two programs, I was wary of spending too much money on costumes, so I decided to do what I’d done before in buying a plain, unstoned dress and add crystals myself. Having done it once before, I felt pretty confident I could turn a plain black dress into something interesting, with the help of thousands of crystals and hours and houuuuurs of free time. Skate sharpening is one of those things that stresses me out more than it should. Or maybe it’s something that stresses out all figure skaters (at least the adults — I imagine the kids don’t really think much about it and their parents do all the worrying), since we tend to be perfectionists, attentive to details, and picky about all aspects of our skating lives. Before I moved, I went to two skate sharpeners, depending on their schedules and my needs. One was a very good sharpener but was only around on weekend mornings, but I liked going to her because she would do them right then and it would take 10 minutes (on top of the half hour drive there, and half hour drive back). But she was occasionally unavailable, so I would go to the second sharpener, who was not as good but serviceable. I didn’t like that sometimes I had to leave my skates overnight with him, though, which could affect my practice plans. When I moved to a new city and rink, I asked around for recommendations and was glad to find a convenient option — the sharpener worked out of the rink I skated at, and was often around when I was there to skate. All I had to do was call in advance to confirm he’d be in the shop at a specific time, and I could usually skate right afterward, so it didn’t take much time out of my day. But the last time I needed a sharpening, I had the devil of a time actually getting it done. I texted him in advance as usual, made an appointment, and went in. He was a no-show. He let me know later that he was running late, but I’d already gone home so we rescheduled. I had to wait till the following week till he could be in, my blades were getting very dull and I was starting to slide around a lot, but I didn’t have much choice so I agreed. The problem was, the morning of that appointment (a Monday), he texted me as I was on my way to the rink and said he had to reschedule for Thursday. Again I agreed, figuring better late than never. But then he was a no-show again! This time, there was no apology or text or explanation, and I was getting incredibly annoyed. I also really needed a sharpening — I was two weeks overdue at this point, which doesn’t seem like much except that every practice was getting worse than the last, the duller my blades got. I started to lose my spins and was skidding my jump landings. On top of that, I was testing soon (this was before my silver moves) and I really couldn’t test on (1) dull blades, or (2) a super fresh sharpening that I hadn’t gotten used to. So I asked around and found another sharpener, a 45-minute drive away. It’s not an ideal setup because the skating sessions are in the morning and the shop is open in the evenings, which means I couldn’t go to get a sharpening AND skate. Still, at that point I was past nitpicking, and so I called in the morning to confirm the sharpener’s hours, and was told to come by in the late afternoon. I made the drive over, and of course when I got there, I was told he’d called in sick. Urg! I tried the same thing a few days later, and got lucky that time — the sharpener was in, and I was out the door with freshly sharpened blades in 15 minutes. Victory! At least, I thought so… until I tried out my skates the next morning and couldn’t do a single thing! Turns out, he’d defaulted to the half-inch sharpening instead of the 7/16 inch I usually use, which was probably my fault because I must not have specified. My old sharpener used to check the setting before each sharpening and redo the same grind, and I must’ve thought the new guy would do the same. Alas, not the case. I couldn’t return to that sharpener till the weekend, which means I skated a week on those wonky blades, trying to do skills I’d taken for granted, like regular forward 3-turns, or edge pulls, and failing miserably. It’s such a demoralizer when you can’t do a single thing right! I was ready to tear out my hair by the end of the week, because my practices felt useless and everything felt alien to my feet. When I got back to the sharpener, he confirmed that they’d been done at a half-inch radius, but on the upside he actually redid them for free, when I’d been prepared to repay since it was my mistake. When I got back to the rink the next Monday, I held my breath as I stepped onto the ice, worried that maybe all the trouble I’d been having the past few weeks was really just me being a worse skater than I’d thought I was. Because even if my blades were sharpened wrong, shouldn’t I still be able to hold a simple edge, or know the basic mechanics of a spin without falling out before even making a single revolution? The blades felt good, though, and I was thrilled to hear that beautiful edge rip on simple cross strokes and edge pulls, which I hadn’t heard in weeks. I tentatively tried a spin, willing myself not to skid out of the entry… and pulled off the most beautiful, centered forward scratch I’d performed in months. Success! Also, apparently a good sharpening really IS everything. 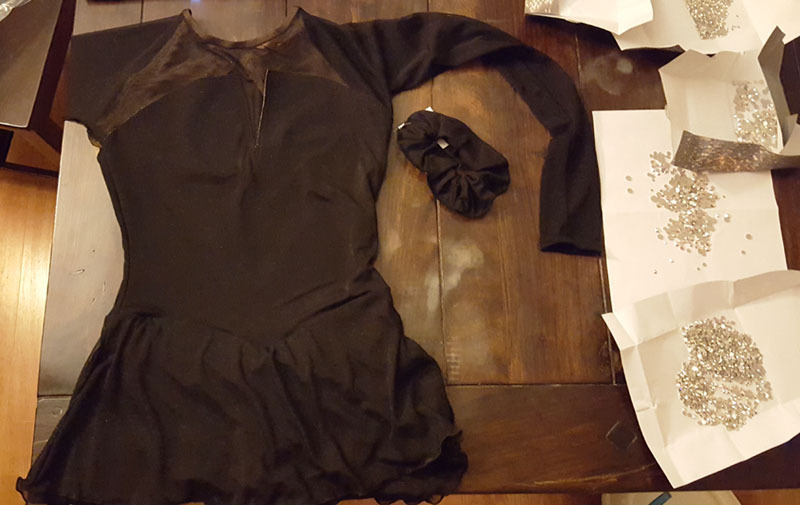 When I first heard about stoning your own figure skating dresses, I was completely at a loss. I’ve never been a crafty person, I can barely sew a button, and I don’t know the least thing about sequins or glitter or crystals. But it seemed like ALL figure skaters knew about this mysterious world of sparkle, and that it was understood that you would naturally stone your dresses to get it. But I had no clue where to start. The internet is great, but all the references I found were written by people who… knew stuff. Who assumed you knew stuff. Who talked about hot fix vs. flat back, gross, Swarovski vs. Czech, 5mm vs. 20SS, and basically was way over my head from Step 1. I knew that I didn’t have $600 bucks to order a custom-stoned dress, but once I saw the difference that crystals can make, I wanted the bling. And I decided I would have it.